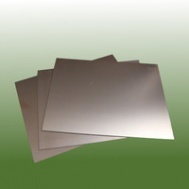 1oz copper clad is typically used in the manufacture of double sided PCB's with Plated Through Holes or Via's. The 1 refers to the thickness of the copper foil cladding. In low current digital applications either 1/2oz or 1oz can be used, for high current or very low resistance applications 1oz is often specified. The copper clad is based on FR4 (Flame Retardant 4). FR-4 describes the board itself with no copper cladding. Bare FR-4 is yellow/green in colour. Typically FR-4 for PCB manufacture is clad in 1oz or 1oz copper foil.